Is your Lab looking a little chilly ? Do you want to help keep him warm and comfortable when the weather gets cold? 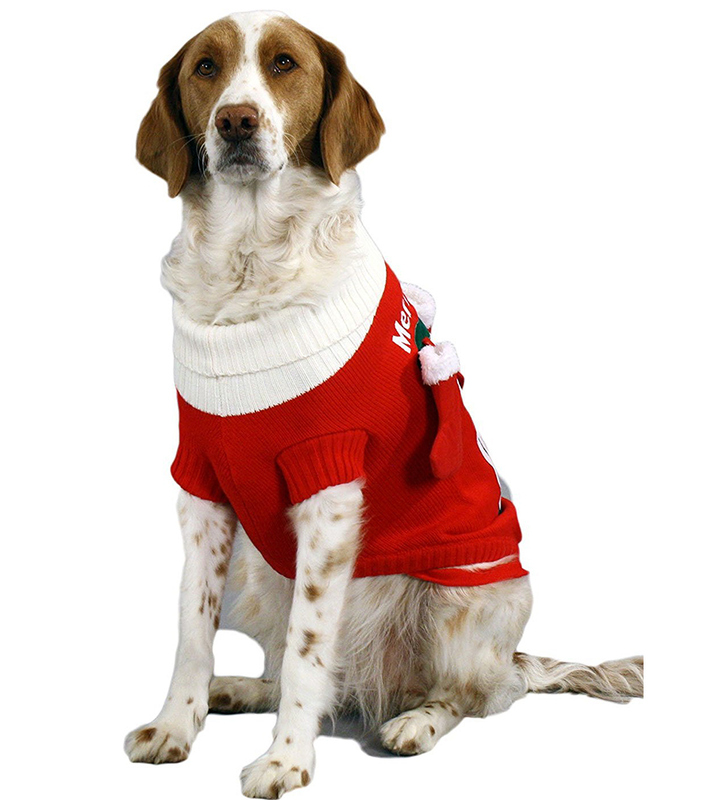 We have put together a selection of great dog sweaters for Labradors. From fun themed ideas to practical, cute Labrador sweaters. There is a dog jumper to keep every pooch and his owner happy. You’ll be able to find the perfect dog jumper to keep your Lab warm and cozy in the cold weather! Is it harmful to put clothes on our dogs? Not everyone likes the look of dog clothing, so you may find you get some interesting comments if you do. Actually, putting coats on dogs is nothing new. Sporting dogs have been wearing coats before running in competitive events for years. That’s because warm muscles are less likely to tear or rupture than cold muscles. And many rugged and tough Labradors that work as hunting companions will wear a fleecy sweater to keep them warm on the journey home after a long day in the field. As you can see, if your Lab wears a sweater from time to time, he is in the best company! So go ahead and indulge him if a smart new dog sweater appeals to you. When there is a chill in the air, even your furry Labrador can feel the cold. Especially if he is getting on in years. Fortunately there are some great fun and practical dog sweaters out there that your Lab will love. When it comes to warm dog sweaters, there is one brand which seems to stand out above the rest at the moment. Chilly Dog Sweaters. They come in a great range and have excellent reviews on Amazon. The Chilly Dog Boyfriend Sweater comes in sizes XXS to XXL. Size L is designed to fit 28 to 40 pound dogs, size XL fits 60 to 80 pound dogs. Depending upon your Lab’s stature, one of these will probably be the best bet. The jumper is 100% wool, giving a lovely soft finish. It is made using organic plant dyes. These gorgeous dog sweaters are hand made, so you may find some variation in color and style. Find out more about the Chilly Dog Boyfriend Sweater on Amazon here. Chilly Dogs American Flag Dog Sweater is a tasteful, patriotic take on the dog jumper. It comes in a range of sizes, from XXS to XXL, so you are bound to find one the right fit for your dog. This cute, fun dog sweater is made of wool with organic plant dyes. They are also hand made so may vary slightly in color and style. 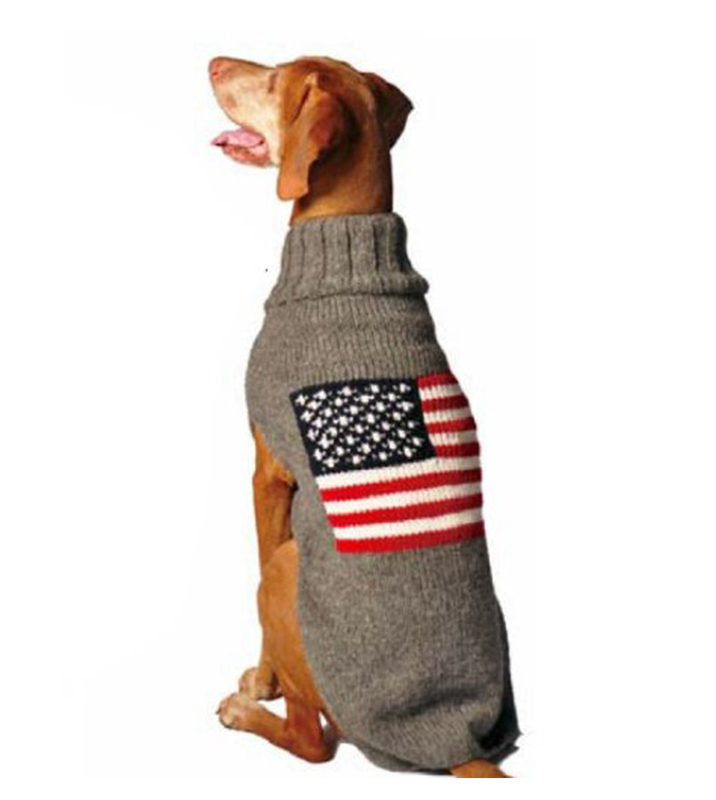 Find out more about this gorgeous American Flag Dog Jumper here. The Chilly Dog Navajo Sweater is another very well reviewed dog jumper. Currently available in the large size only, this design should suit slimmer, lighter boned adult Labs. Most working line bred Labs will have the right fit and find it very comfortable. It is made of 100% wool and colored with organic plant dyes. Like all Chilly Dog sweaters it is hand made, so might not look exactly like the dog jumper pictured. 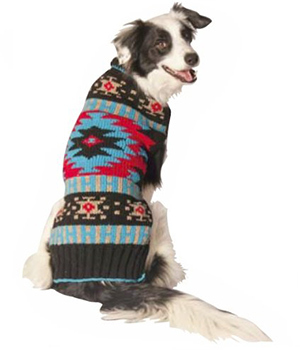 Check out the Chilly Dog Navajo Sweater here. 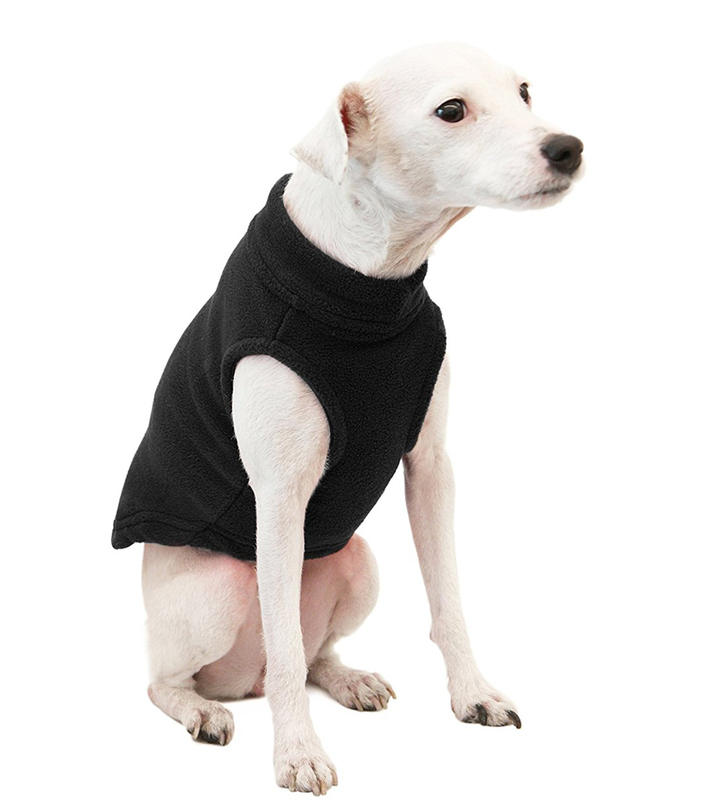 The Stretch Fleece Dog Pullover by Gooby is a simple but very practical design. This cute fleece is available in a great range of sizes. From XS all the way to 6XL. The handy sizing chart will help you to pick the best size for your dog. In eight different bold colors, this simple fleece can make a statement too. The stretchy material makes the dog jumper easy to put on and take off. It also gives a comfortable fit when your Lab is wearing his sweater. 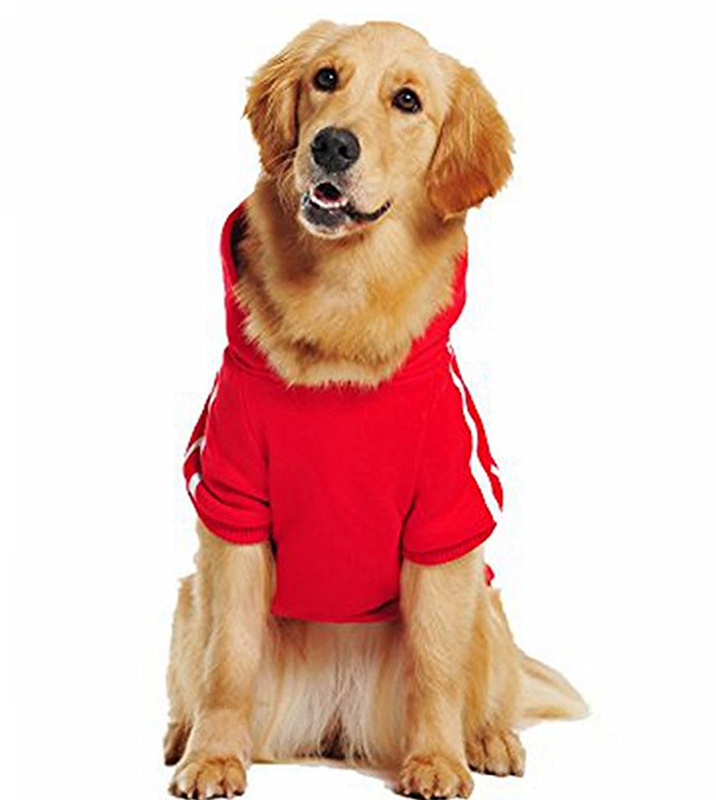 Find your Stretch Fleece Dog Pullover on Amazon here. 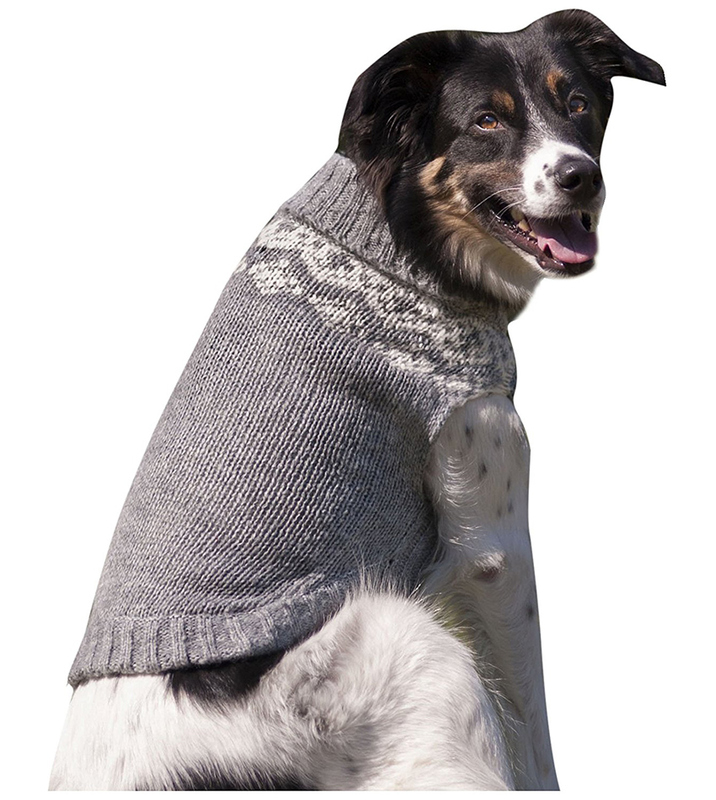 The Natural Cable Dog Sweater is also from Chilly Dogs. We love the style of this jumper, which is very well tailored. It is available in sizes XXS to XXL. Most adult Labradors will fit the L or XL size depending upon their build. It is 100% wool and made using only organic plant dyes. You can find out more about the Natural Cable Dog Sweater here. 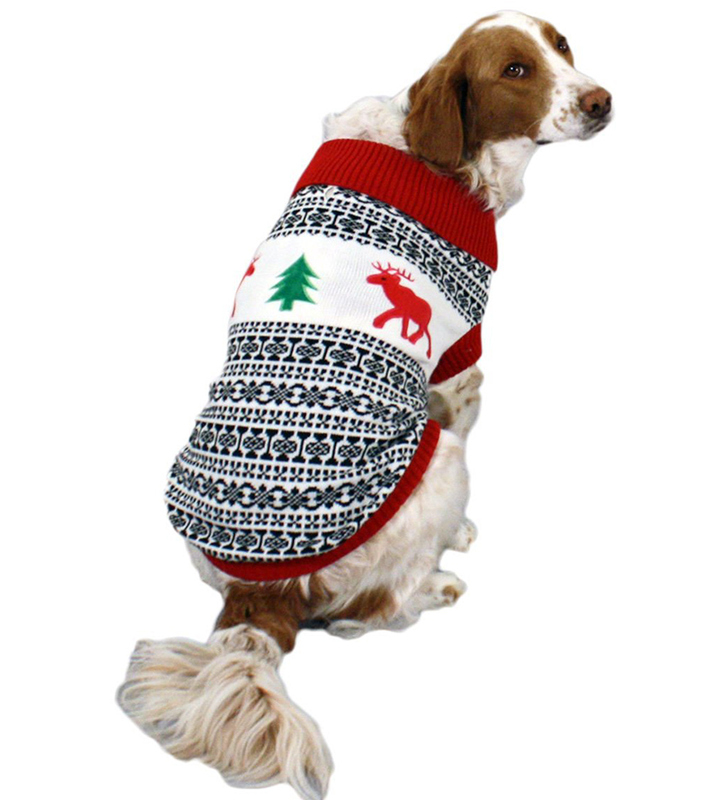 Fashion Pet’s Fair Isle Dog Sweater is cute and well fitted. It comes in sizes from Extra Small to Large, with size Large being the best fit for most Labs. This turtleneck style sweater is warm, cute and machine washable. It will keep your Lab warm and looking even more adorable than usual. Find out more about the Fair Isle Dog Sweater by Fashion Pet here. 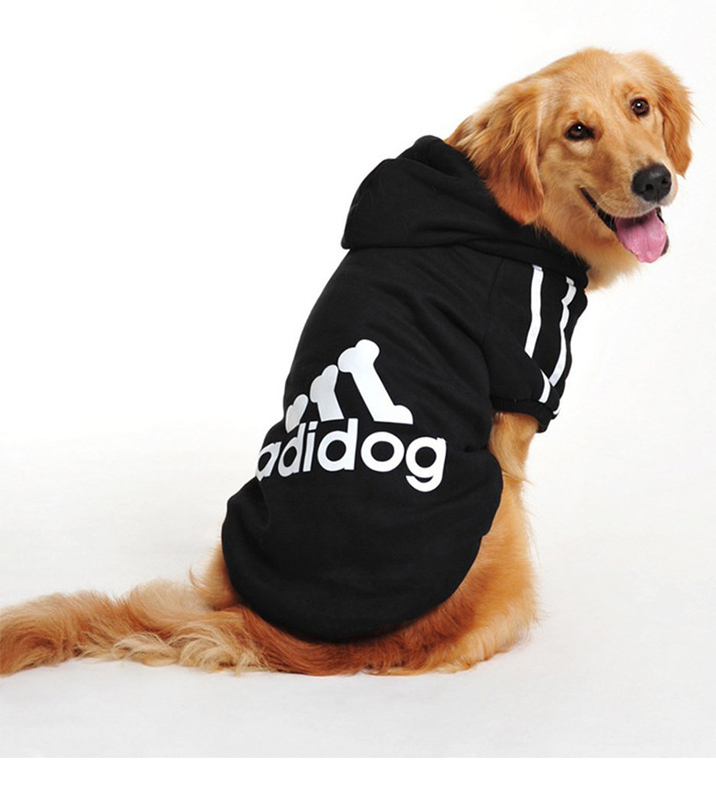 Adidog Hoodies are of course a fun play on the popular Adidas design. These quality hoodies are 100% cotton. Giving them a durable and comfortable finish. The sizing is slightly strange, ranging from 3XL to 9XL, however there is a good measuring chart that can help you to work out which size will suit your Lab best. Either 7XL or 8XL should be the right fit for most fully grown Labradors. 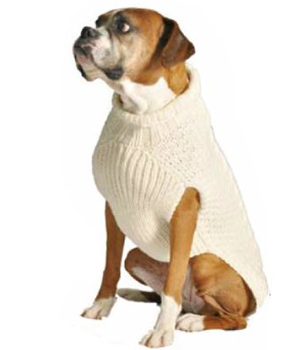 The manufacturer claims this sweater can ease scratching for dogs with skin conditions. I recommend that if your dog has skin problems, you have a quick chat with your vet before you try it. Just in case your dog’s particular condition could be aggravated or exacerbated by the contact. 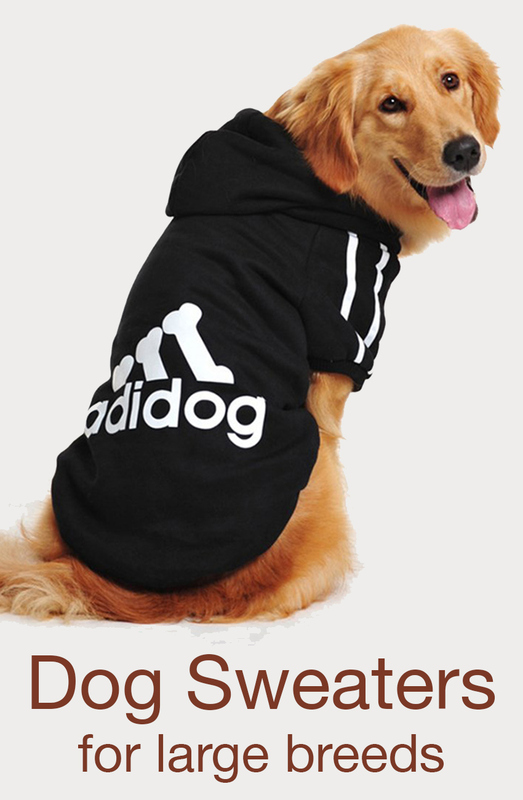 Find your Adidog Hoody on Amazon by following this link. The Kailian dog sports hoody is designed with larger breeds in mind. They are sized between 3XL and 6XL. The 4XL or 5XL will probably be the best choice for most Lab owners. This great quality dog sweater is made of soft, comfy cotton. Just right for your lovely Labrador. Check out the Kailian Dog Sports Hoody range online here. This fun I Love My Mommy Dog Sweater is cute as well as practical. At size XL it should fit most Labradors. Giving them a soft, warm and comfortable dog jumper to wear. Not to mention one which makes his true feelings known to the world! A fun design, with bright colors. 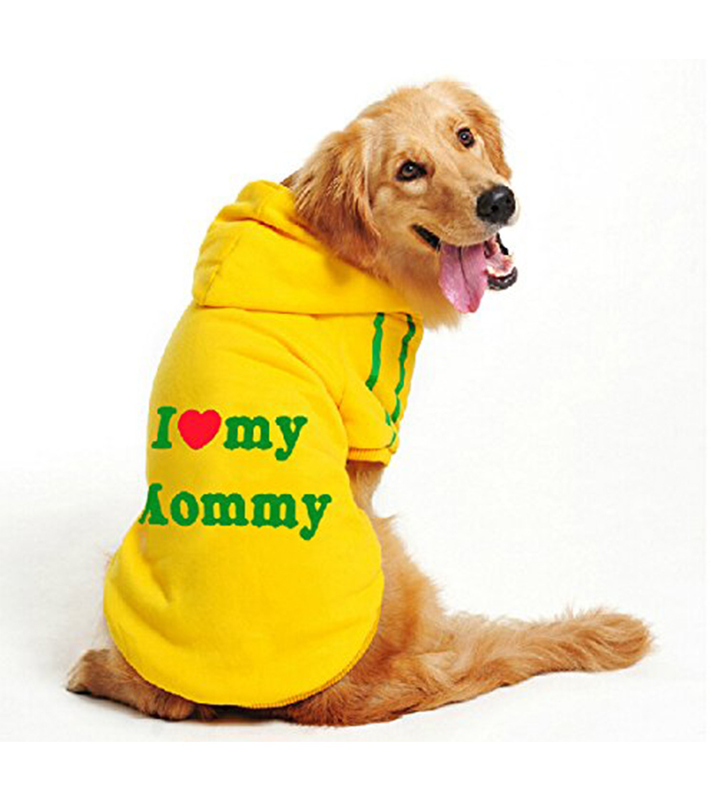 Get your I Love My Mommy dog sweater from Amazon here. If you are looking for a sweater to get you and your Lab into the holiday spirit, then you might like some of the fun dog sweaters we have found below! This cute Holiday Reindeer White Sweater is festive without being too extravagent. It comes in a huge range of sizes, from small to extra extra large. L or XL being the best choice for most adult Labs. It even has an opening at the top to allow you to easily attach your leash. So you can keep his festive vibe going on your walks as well as at home. Check out the Holiday Reindeer White Sweater here. 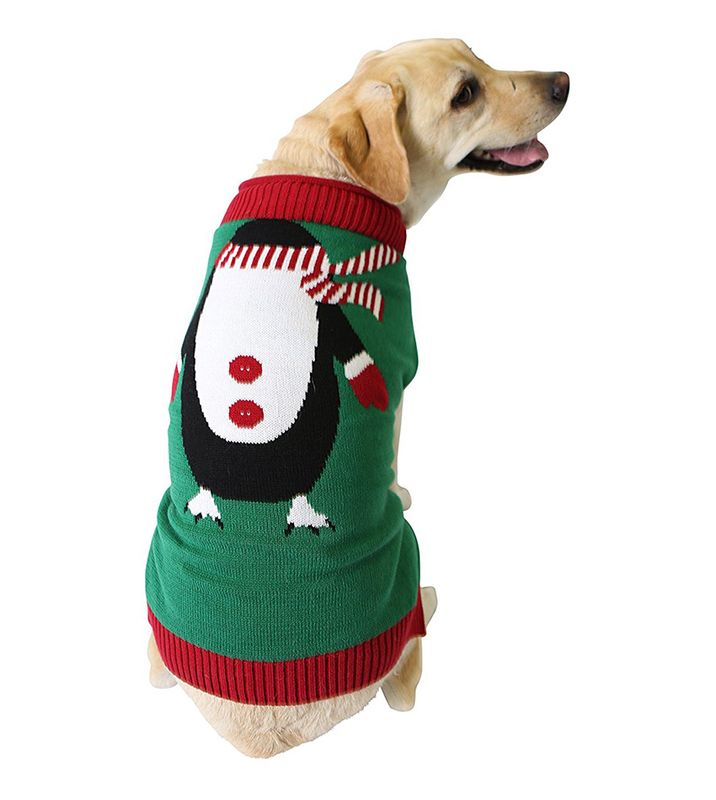 The cute Penguin Dog Sweater allows you to get your Lab dressed up when you do. It comes in sizes XS to L, with L being the right choice for most adult Labradors. This fun Christmas dog costume will get you both in the holiday spirit all day long. Find your Penguin Dog Sweater on Amazon here. 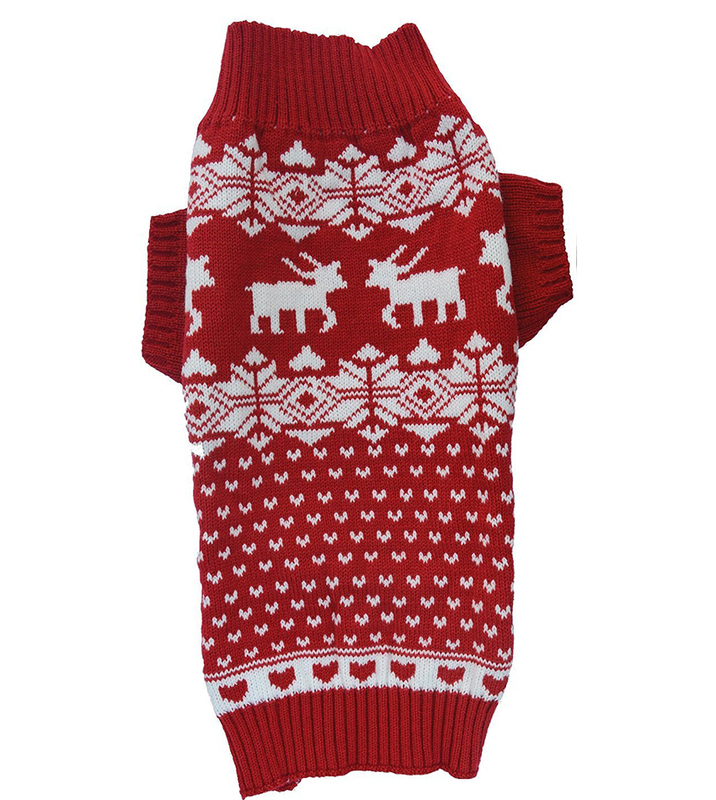 If you are looking for Christmas dog sweater with a fun yet traditional feel, then look no further. This Red Reindeer Holiday Sweater is warm and cozy. Made of 100% acrylic, it is also suitable for machine washing. Size XL will suit most Labs, with back length of 20 inches, neck girth of 20 inches and chest of 22-26 inches. Find out more about the Red Reindeer Holiday Sweater here. 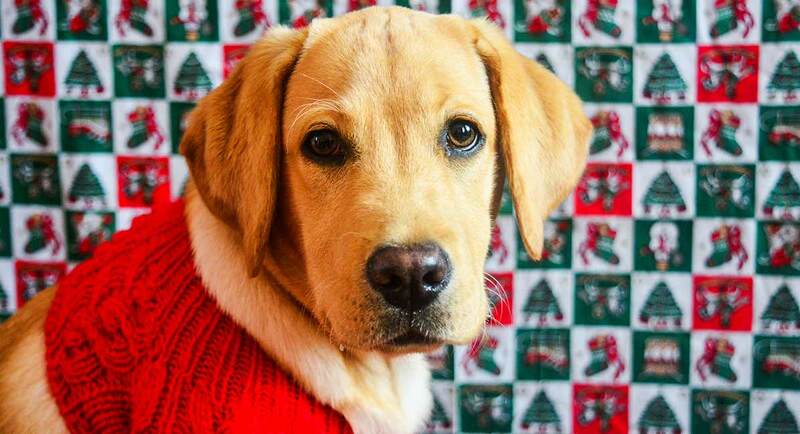 If you and your Lab like dressing up, then why not try this Elf Dog Sweater. The cute outfit is also soft and warm. In sizes XS to XL, the L or XL suiting most adult Labradors. 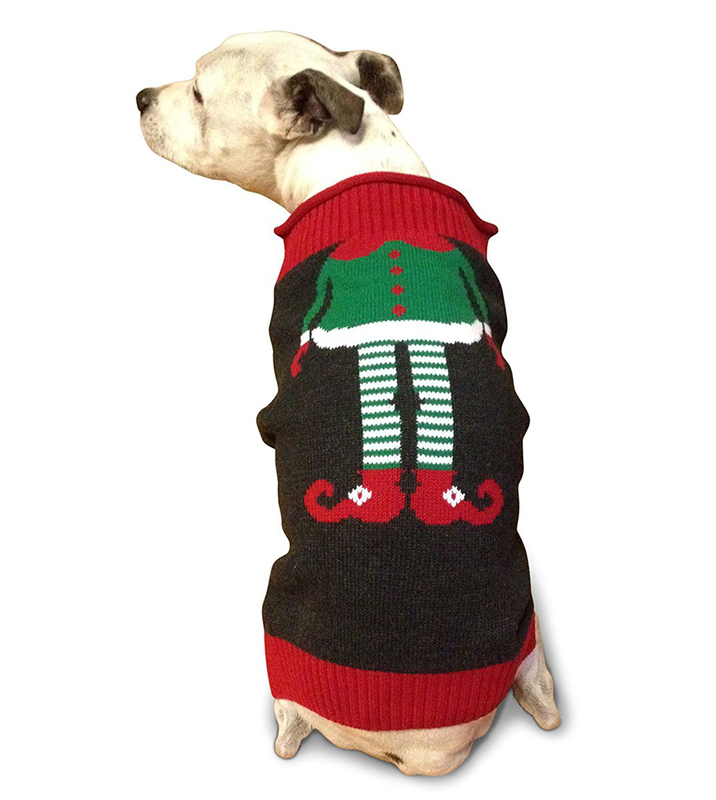 Check out the Elf Design Dog Sweater on Amazon here. 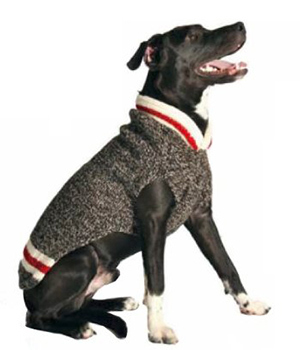 A novel idea for a novelty jumper – the Fireplace Dog Sweater. Complete with a picture of a cozy roaring fire, with loose hanging stockings attached! It comes in a big range of sizes from XXS to XXL. Where L or XL will be the most likely fits for Labs, depending upon your dog’s chest size. There is a handy measuring chart to help guide you to the right choice. A high quality, fun holiday dog sweater. You can find your Fireplace Dog Sweater online here. 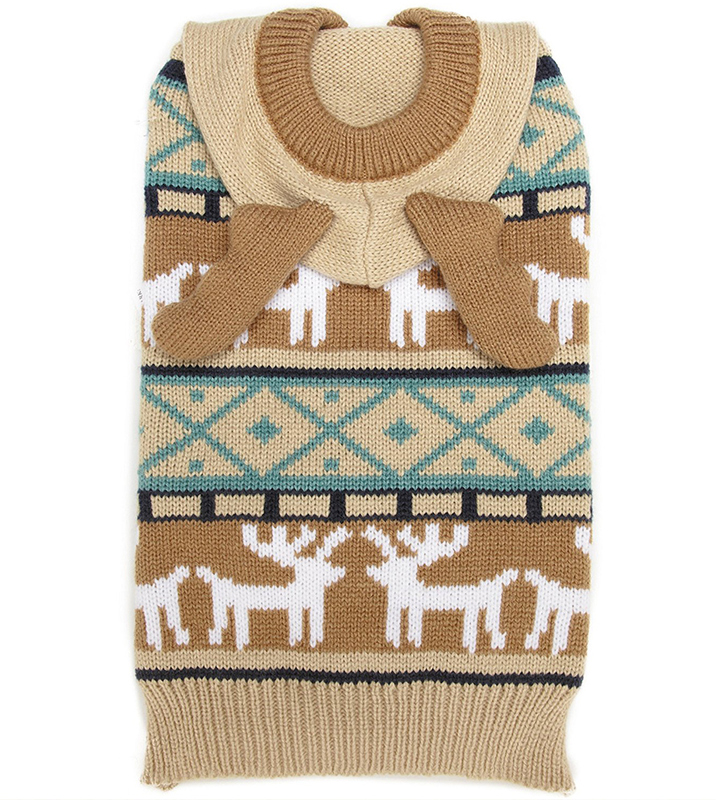 Finally, what Christmas would be complete without an Antler Dog Sweater. A hooded sweater has adorable knitted antlers on it’s head. This cute and quirky holiday sweater comes in sizes XXS to XL. It is a warm, cozy dog sweater, made of 100% acrylic yarn. Check out the Antler Dog Sweater on Amazon here. Next articleCan Dogs Drink Milk? You might be amazed how much love both you and your dog get shown at a local knitting store. There are lots of books for dog sweaters, and the owner of the shop may well be able to fit the sweater to your dog. Dog sweaters don’t take a long time to knit, and you might even decide to take up needles yourself. I made our aging Labrador a neon pink sweater that helped us see her when she was out in the dark. She wanted to wear it inside and out!!! I’ve never had anyone be so enthusiastic about something I made for them!!! Be prepared for endless appreciation.